A key factor for the development of the tourism sector is the employment of well-trained personnel. This is what Deputy Minister of Tourism Irena Georgieva said in the "Yes! To the Bulgarian regions!” discussion, which is a part of the national campaign “Yes! To the Bulgarian economy” of “Standart” Newspaper and of the Confederation of Employers and Industrialists in Bulgaria. "The problem with the personnel cannot be resolved within one or two years, but it is important to lay the foundation and to identify measures, which will bring the expected results in the long run. That is why we created the Interinstitutional Council for Personnel in Tourism chaired by the Minister of Tourism. It has already started its operation and I hope it will soon introduce some specific proposals”, said Irena Georgieva, who chairs the council. She recalled that according to data of the World Travel and Tourism Council, in 2015 the total number of jobs in the country, directly or indirectly related to tourism, were 338,000. The employment in the sector and associated industries is 11% of all jobs in Bulgaria, which is a confirmation that the issue concerns a large number of people and is important for the economy as a whole. Solving the problems of tourism is very important not only for the economic development, but also for the sustainable growth in the regions, as became clear from the words of Deputy Minister Georgieva. Tourism increasingly becomes a driving force for overcoming the imbalance between them and for providing employment in the less developed parts of the country. She highlighted the expectation for an extremely active summer season. The selection of Burgas as the centre of the discussion is symbolic, because it is not only a symbol of the Bulgarian summer tourism, but also an example of sustainable development of an entire region. In 2015 Burgas provided accommodation to over 1.3 million tourists, which is a 3% growth compared to 2014, and the increase of Bulgarian tourists is over 15%. For the first four months of 2016 Burgas region provided overnight accommodation to 20% more tourists. "It is even more pleasing that the region attracts foreign tourists not only in the summer months, for the same period of 2016 the growth is about 45%”, summarized Irena Georgieva. 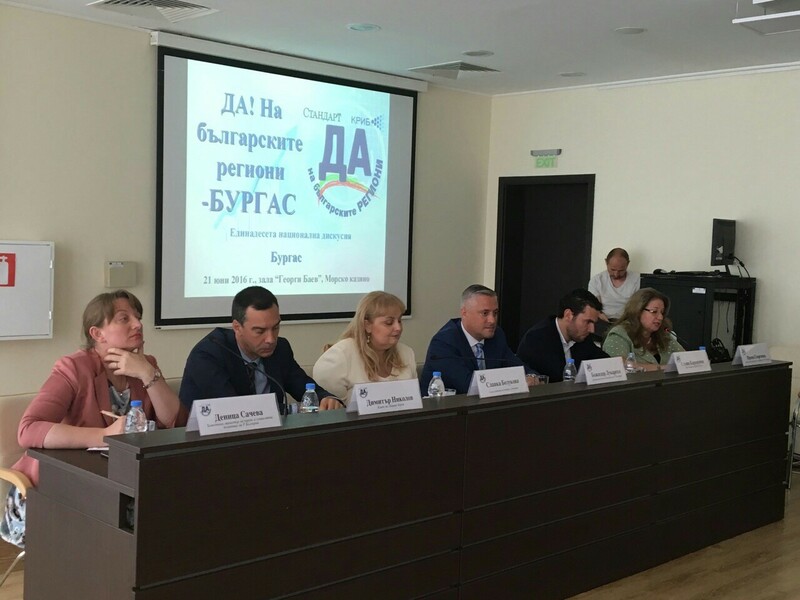 The debates were also attended by the Minister of Economy Bozhidar Lukarski, the Deputy Minister of Labour and Social Policy Denitsa Sacheva, the Mayor of Burgas Dimitar Nikolov, the Governor Valcho Cholakov, the Executive Director of the Confederation of Employers and Industrialists in Bulgaria in Burgas Stoyan Karanenov etc.